Visit the award winning Coffs Harbour Butterfly House, one of Coffs Harbour’s most amazing attractions. The Butterfly House is open from 9am to 4pm all year round except during NSW school terms, when we are closed on Mondays. During NSW school holidays we are open 7 days a week with the exception of Christmas Day. The activity level of the butterflies is determined by light, temperature and humidity, therefore the butterflies are normally more active between 10 am and 2 pm. For all enquiries, feel free to contact us by calling 02 6653 4766. 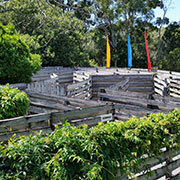 For the young and the young at heart, our outdoor maze is sure to entertain. Maybe you can try to lose each other or just have fun hunting for the hidden answers as we test your butterfly knowledge. Our cafe offers a wide range of light refreshments in a perfect, tranquil setting. Whatever you choose, be assured your taste buds will enjoy the experience of our quality homemade food and refreshments. 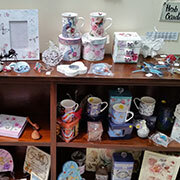 Whether you are after a memento of your visit to The Butterfly House, a gift for a special friend or a butterfly bargain, our gift shop is the place to stop. There’s something for every butterfly lover out there. Group rates apply to bookings for 10 or more people. The discounted admission price of $13.00 (including GST) for adults provides an informative talk about the butterfly lifecycle with a question and answer time, a guided tour of The Butterfly House and a walk through the maze if desired. The time needed for these activities is between 1 and 1½ hours. All prices are in Australian dollars and subject to change without notice. Bookings are essential for this discounted admission price. The discounted admission price cannot be used in conjunction with any other offer. We are also able to provide morning or afternoon teas or light lunches for your group at an additional cost. Please contact us to obtain more information, menus and availability of our venue to organise your groups encounter at The Butterfly House. After purchasing a Butterfly House Yearly Pass, you are free to visit as often as you like during the next 12 months. Be amazed at the changes, the beauty and the tranquility. See the ever-changing seasons at the Coffs Harbour Butterfly House – a great gift idea to give to your family and friends! At the Coffs Harbour Butterfly House we are able to provide students of any age with a unique and unforgettable educational experience. As well as touring the Butterfly House with one of our staff and having an exploration of the maze, we will organise an age appropriate activity to develop understanding of the butterfly lifecycle. 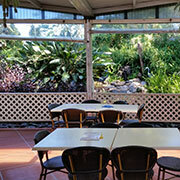 The Butterfly House grounds provide shaded, grassed areas for rest and meal breaks for the students. We can also cater for teachers and parents as morning or afternoon teas or lunches can be booked. We charge $9.00 per child (including GST) and allow 1 adult free of charge with every 10 paying children. Additional adults are charged our discounted admission rate of $13.00 per adult. All prices are inclusive of GST and subject to change without notice. Come inside the Coffs Harbour Butterfly House and almost instantly you will be surrounded by hundreds of live Australian butterflies! Our knowledgeable guides will be on hand to answer any of your butterfly questions and to share the experience of the butterfly life-cycle with you.